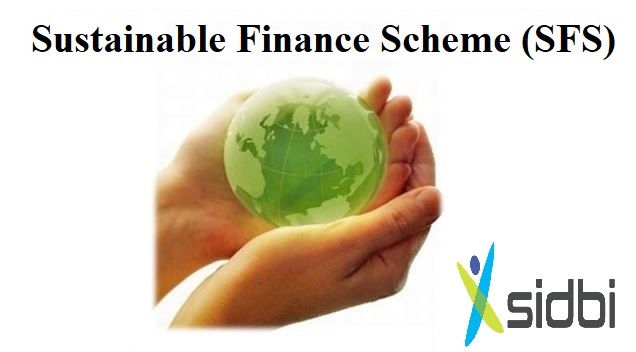 SIDBI introduced a new scheme called sustainable finance scheme during 2012-13 for those sustainable development projects which contribute in energy efficiency and cleaner production but are not covered under international or bilateral lines of credit given through international or bilateral agencies. Thus, all sustainable development projects like renewable energy projects, green buildings, green micro finance, Bureau of Energy Efficiency (BEE) star rating and eco-friendly labelling, etc. are covered within the scope of this scheme. In addition, the financial assistance has also been rendered to Energy Service Companies (ESCOs) and Original Equipment Manufacturers (OEMs) engaged in manufacturing energy efficient and cleaner production equipment. The objective is to assist the entire value chain of energy efficiency (EE) /cleaner production (CP) and sustainable development projects which lead to significant improvements in EE / CP / sustainable development in the MSMEs and which are presently not covered under the existing sustainable financing lines of credits. New / existing MSME units, as per the definition of the MSMED Act 2006, shall be eligible for assistance under the scheme. Existing units should have satisfactory track record of past performance and sound financial position and should not be in default to institutions/banks. Units should have minimum credit rating of investment grade or its equivalent as per internal credit rating model. Renewable energy projects such as solar power plants, wind energy generators, mini hydel power projects, biomass gasifier power plants, etc. for captive/ non-captive use (i.e., power generated is sold/supplied to the grid / off-grid). Any kind of potential CP investments including waste management. Expenditure on energy audit / environment compliance audit / pollution control & management consultancy services. Expenditure on green rating, BEE star rating, ecofriendly labeling, etc. ISO 50001 / 14000 or other accredited energy/environmental certification. Suitable assistance by way of term loan / working capital to ESCOs implementing EE / CP / Renewable Energy project provided either the ESCO should be an MSME or the unit to which it is offering its services is an MSME. Suitable assistance to OEMs which manufacture energy efficient / cleaner production / green machinery / equipment. The assistance could be either in the form of Deferred Payment Guarantees, Channel Partner / Referral arrangement, etc. Either the OEM should be a MSME or it should be supplying its products to substantial number of MSMEs.